Dave reported to me that the most reliable location was on the ground at the north end of a row of White Pines along Callie Dr, mixed in with a flock of 20+ Chipping Sparrows. Indeed, this proved to be the only location at which we saw it despite 2 hrs of searching throughout the area. Dave also had it 100 yds west of Callie near two old vacant buildings/barns. 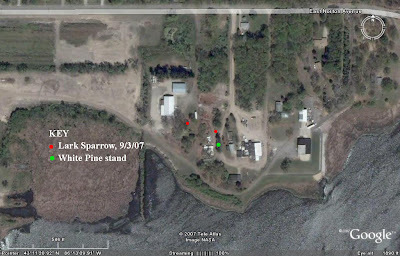 Here is a map of the area showing the location of the White Pine stand and our 2 sightings today, 9/3/07. 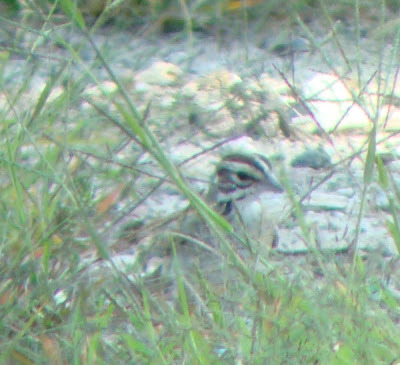 Perhaps the best tip is to first locate the flock of Chipping Sparrows- they are moving east to the neighbor's yard and west to a vacant field ~200 yds west of Callie Dr, often high in the towering oaks, but then coming down to the ground to feed. 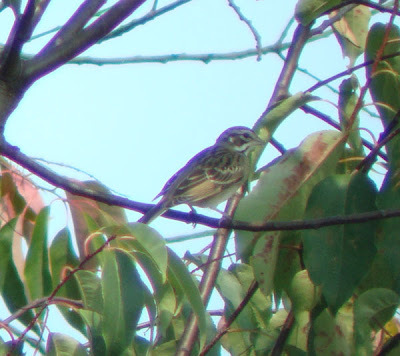 We first spotted the bird as it came down to feed on the ground, first perched in a tree ~30 feet up, then on the ground. Good luck! Ever see a bird in the moon?